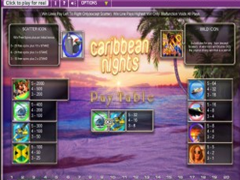 Caribbean Nights Pokie Review - Play today! It’s time to relax and sail of to enjoy a full night of adventure and fun on the Caribbean islands offering beach front dancing, hot tubs outdoors, great holiday makers and the rhythm of the bongo’s being played by the Caribbean natives. Openbet created as much fun as the reels could stand and players will enjoy the great audio. Magnificent graphics on 5 reels with 20 paylines and the most exquisite features including scatters, wilds, multipliers and free spins. So grab a cocktail, kick back, relax and let the fun begin with a large coin denomination allowing bets from a low minimum of 0.05 per line to the maximum accepting offers up to 50.00 per spin. 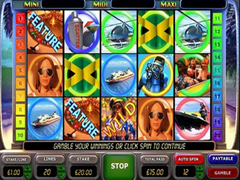 The jackpot offers a wonderful Caribbean splash payout of 2.000 bonus coins. Set on the island with a view of the ocean in the sunset the reels will keep you astounded with great graphics and the best holiday mood setting symbols. The pink textured tab at the bottom of the reels offers home to all the operational keys for the game and the keys are easy visible in green. The symbols offers holiday makers having great fun in the sun, sunset view across the ocean, silver shaker and cocktail, yellow aircraft bringing more holiday guests, helicopter and boat cruise taking holiday makers on an ocean trip. The wildcards will give you the opportunity to give you winning for combinations that are incomplete. The symbols are presented by the man with a green hat and glasses, he will act as other symbols that will result in combinations getting completed. He can be displayed on all the reels to give you the rewards he has been set out to give you, when you get more than one of them in the right positions they will work together to give you bigger combinations and reward you with even more complete winnings. The scatters presented the martini and the shaker that you will need to get to win great multipliers and free spin. The game will need to see you present 3 of the scatters together, but the easy part of this is that you don’t even need to get them in any kind of active lines, they will reward you even when they appear scattered on the reels. You can win up to 10 times the wager to go along with your free games, which will be rewarded according to the amount of scatters, you will receive a minimum of 15 free games and a maximum of 25 free games when you get 3 to 5 scatters. You have to try this pokie as it offers that great escape to the island everyone needs. The symbol are well themed and fun to spin into great wins on the reels. The cocktails all over the reels gets you easily into a winning party mood.